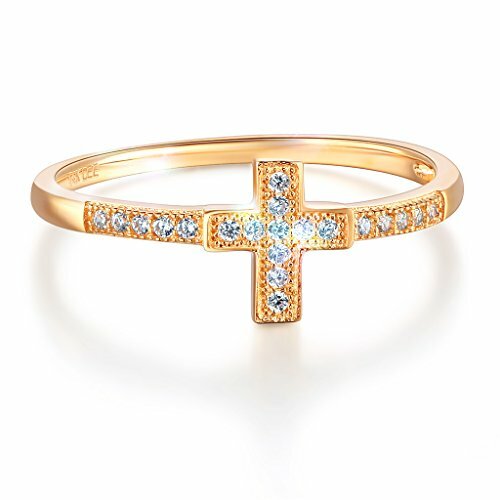 Wellingsale Ladies Solid 14k Yellow Gold Polished CZ Cubic Zirconia Religious Cross Right Hand Fashion Ring - Size 5.5 by Wellingsale® at SCRHI. MPN: SFP-J-LGDI-RG-00791-055. Hurry! Limited time offer. Offer valid only while supplies last. WELLINGSALE® Features:1. Stunning High Polished Finish2. Made using only the most premium and pure materials3. Non tarnish, Stunning Color4. - Other: . . AAA Grade Cubic Zirconia. .
WELLINGSALE® is a registered trademark. WELLINGSALE® products are sold by authorized sellers only. Each purchase includes 3 year complimentary re-service and polishing. If you'd like to refinish your jewelry please contact us! All jewelry purchases made with Wellingsale® include an industry leading lifetime warranty** from manufacturing defects. Manufactured using Wellingsale® quality standards. Quality Guaranteed or your money back! If you have any questions about this product by Wellingsale®, contact us by completing and submitting the form below. If you are looking for a specif part number, please include it with your message.